Our personal eating habits are a direct reflection of what foods we keep in the kitchen. It’s amazing how we can transform our food choices, simply by not buying the junk (!!) 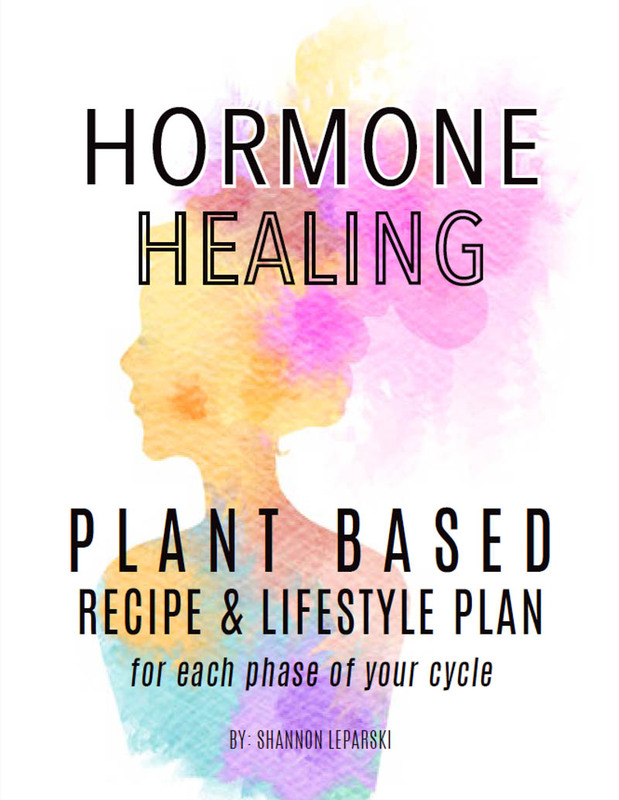 and instead embracing an abundance of plant foods. 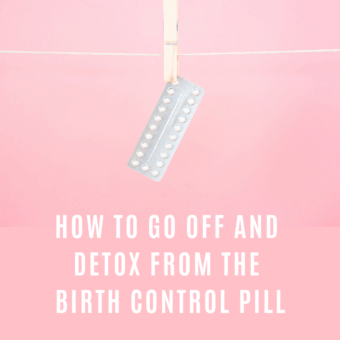 If there’s no junk in your pantry or your hidden stash, you won’t experience the feelings of temptation. Healthy choices start in the grocery store. For me, I like to pretend that I do all of my shopping at Whole Foods. It’s basically a dreamland for anyone, but especially plant based vegans and is probably my favorite place, ever. I feel healthier just by being there!! 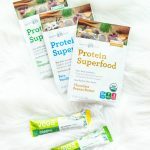 I don’t buy all of my groceries from there quite yet – only the special superfood or vegan items I can’t find anywhere else, along with the 10 other things I didn’t plan on buying, but had to have. Must be the abundance of organic everything and fancy gourmet goodies that are actually vegan! Anyone else?!!! 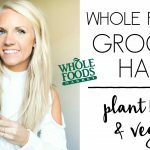 I know you’re obsessed too..
With Whole Foods being the epitome of all things fresh and healthy, all those special vegan treats and goodies can be loaded with fat and unnecessary oils. 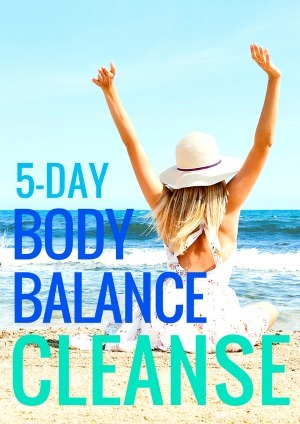 I’ve been making a conscious effort to follow this low fat, high carb plant based diet (without stressing about it though) because it allows me to feel my absolute best, eat unlimited amounts of food and maintain my weight without paying attention to calories, portions etc. You can just be. There is no other lifestyle like that! 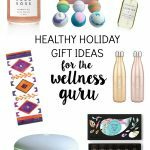 Next time you’re at the store, keep these snacks in mind because it’s easy to grab a not-so-healthy quick fix for a lil’ snackie, but it’s imperative that we love our bodies too with wholesome foods. It’s all about consistency. Sure I promote balance and allow treats like a couple ‘Chocolate Covered Brownie Pops‘ when they’re calling my name 😉 but of course, I feel so much better when I stay on track with healthy snacks instead. 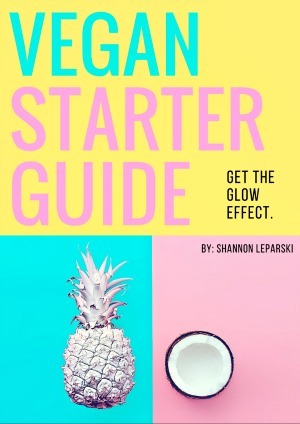 So here are ’10 Healthy Vegan Snack Ideas’ for whenever you are feeling stuck and so not motivated. You will love them!! 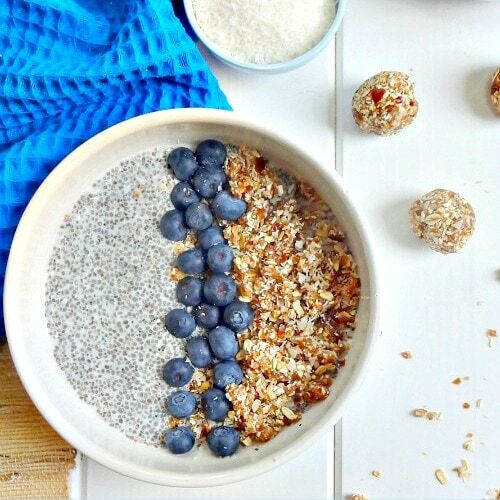 Pour some almond milk over 1/2 cup of this no-bake Chewy ‘Rawnola‘ and you’re golden. Plus, it’s naturally sweetened with gooey medjool dates, also known as nature’s candy. This makes it okay to eat breakfast at any time of the day. 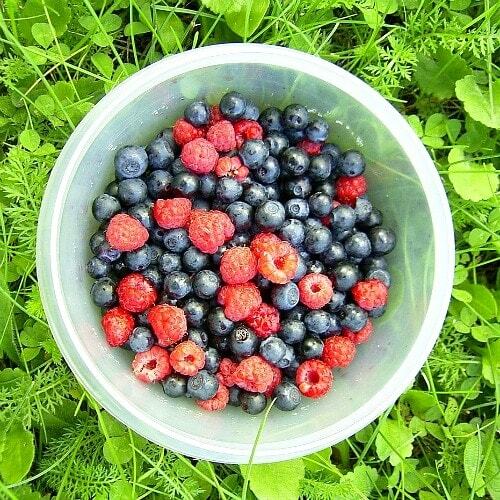 Add 1 cup of your favorite berries to a bowl. Smashing them with a fork is totally optional. Sprinkle on lots of ground saigon cinnamon. 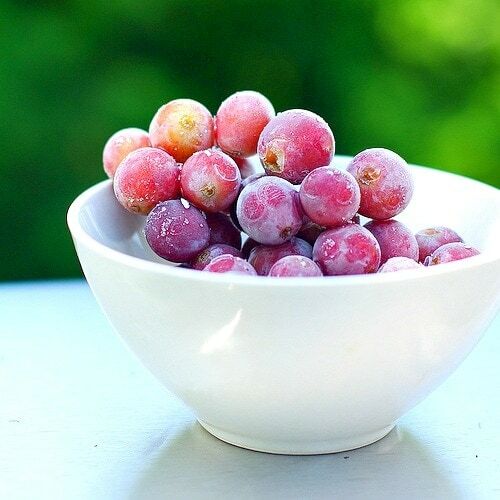 This will satisfy your sweet tooth and balance your blood sugar, all while packing in a mega dose of antioxidants. Vegan smoothies are filling, nourishing, packed with energizing plant foods and.. they’re good for the soul 🙂 Try the Bikini Ready Green Detox Smoothie or the Energizing Green Smoothie Bowl and get your greens in! 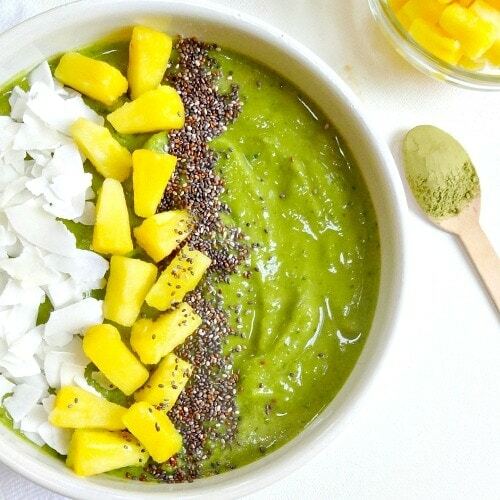 Smoothie Bowls are amazing because you can add extra goodness from your favorite superfood toppings. You may be wondering, why would I sip my smoothie from a bowl?!! Smoothie bowls typically have a thicker consistency than a regular smoothie, making it fun to scoop up, along with crunchy toppings. Smoothie bowls feel more substantial to me, like an actual meal – because most regular smoothies don’t keep me full for long. Try it out! 5) RAW VEGAN “CARAMEL” APPLE COOKIES: Last fall, I wanted to indulge in a vegan-friendly caramel apple. Then this raw vegan creation happened. One of my all-time favorite snacks. 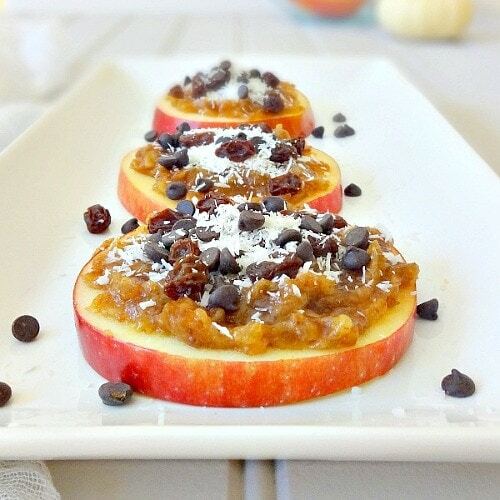 Crunchy Apple Slices smeared or dipped into “Date Caramel” plus your favorite toppings! YUM. 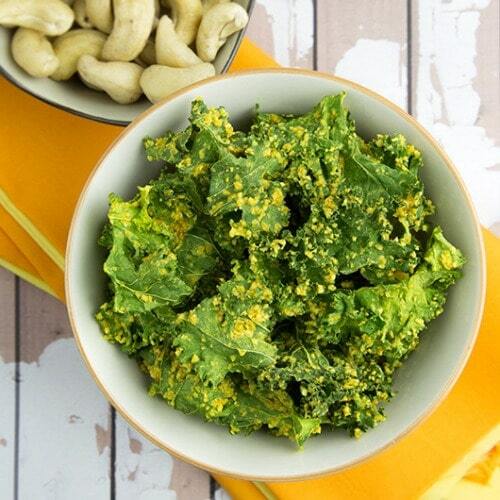 6) KALE CHIPS: For a salty craving, kale chips are the way to go. You can find them almost anywhere now, in all kinds of flavors. I prefer homemade but have yet to share a recipe for Kale Chips here on the blog, so here’s 15 recipes for you to try! Use the least amount of oil possible, if the recipe calls for it. Read more about oils here. 7) POPSICLES: How about some Mango Ginger Popsicles to brighten your day?! These creamy frozen pops really hit the spot. Refreshing, zingy and super simple to make. 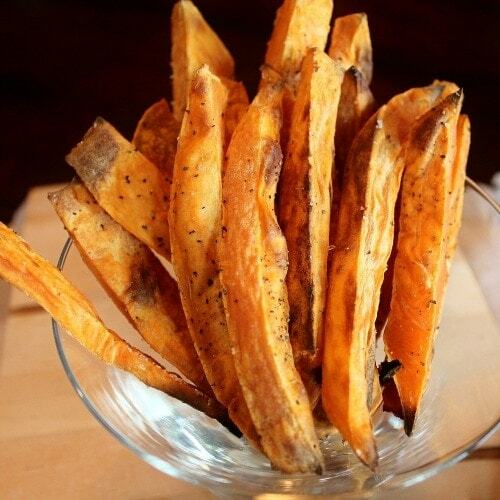 8) OIL-FREE BAKED SWEET POTATO FRIES: Such a simple classic, but there’s nothing better than sweet potato fries – and no oil needed for this recipe from Brandi of The Vegan 8! 9) ROSY GLOW REFRESHER JUICE: A vibrant afternoon pick me up or morning snack. 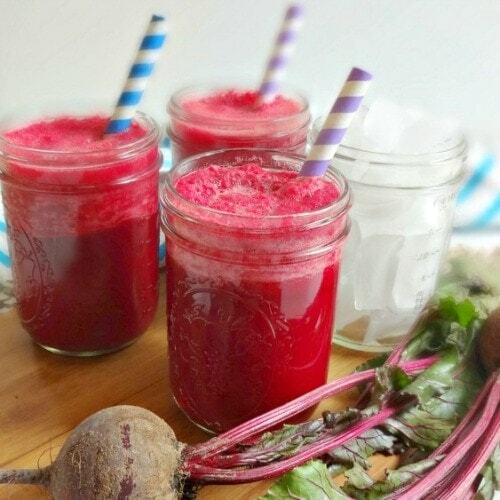 With beets, carrots, apple, ginger and lime, this refreshing juice is amazing for glowing skin and keeps all the fiber, vitamins and minerals in, instead of juicing them out. 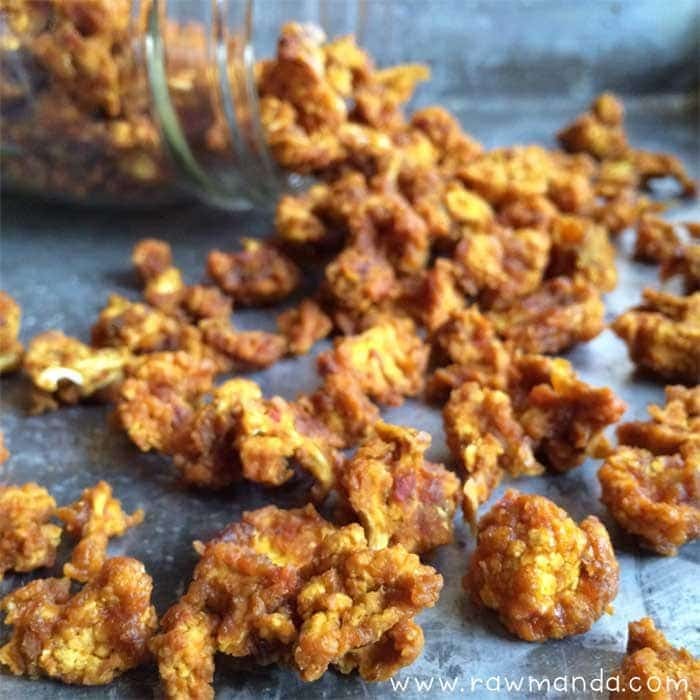 10) SPICY BUFFALO CAULIFLOWER POPCORN: Seriously, RawManda is genius! 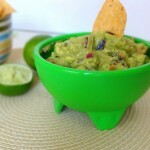 Her creative recipes show us that eating a raw food diet can be so tasty and beyond healthy. This spicy popcorn would be a yummy snack on the go or in place of popcorn for movie night. 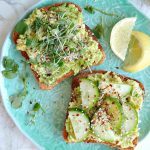 What are your favorite healthy vegan snacks? hi, I have looked at many of your meals you have put on your blog and i hope they will help me cure my stomach pain. I have had stomach pain for years and years. Nothing has helped. Do you have any ideas for any food that might help? Hello there, simply became aware of your blog through Google, and located that it’s really informative. Iâ€™m gonna be careful for brussels. I will be grateful should you proceed this in future. Lots of other folks might be benefited from your writing. Cheers! Thanks so much Shannon for these quick snack ideas. 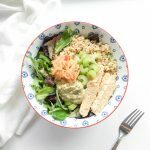 I have shared this link with my FB gang “Super Quick Plant-Based Recipes” https://www.facebook.com/SuperQuickPBRecipes/ – it’s all about PB recipes we can do in 20 minutes or less. I’m sure everyone will enjoy your site when they visit! This is amazing..a healthy popcauli..snack. Definitely trying it out.. I love savoury and spicy foods and this popcorn looks delicious. Trying it out now. Thanks for the amazing recipes. Thanks Lauren, me too! Hope you liked it! 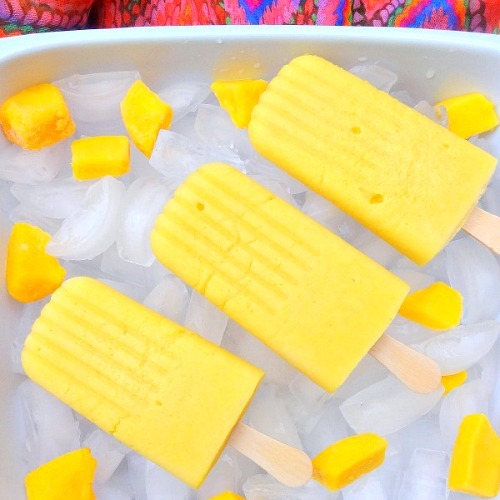 The mango ginger popsicles look so enticing. Thanks to the hot weather, I’ve been looking for something that’s icy cold that’s healthy.